The top employers of Canada will participate in a Virtual Career Expo on April 19 and 20, 2018. This will help them to employ finest global and skilled talent. On the contrary, hiring an employment consultant is the ideal way to find a job and immigrate to Canada.The organizers of Expo believe that 1,500 technology jobs are available for hiring in Microsoft, IBM, Pythian, and the Bank of Montreal. The host of this event is the International Talent Acquisition Center. It is a partner with some immigrant services providers based in British Columbia and Calgary. The organizers also claim of having the support of the federal government. There is a shortage of talent in the technology sector in Canada. Moreover, the federal government has begun the Global Talent Stream in its Temporary Foreign Worker program. Furthermore, this will make the hiring of overseas skilled workers easy. Also, the GTS has a processing time of only two weeks. It has been warmly received by the technology sector of the country. Jobs fairs like the Virtual Career Expo are a positive development but are a weak form of the employment search. Online job boards, of the Express Entry system, keep the job seekers in a competition which has few judges. Employers do not have any interest in screening several resumes. Moreover, most of them are not in a position to provide a precise description of candidates. The internet job boards do not provide much success in the hiring process. Job hunters, as well as potential immigrants to Canada, should learn the art to be outstanding in comparison to other job seekers. Ultimately all of them are competitors for the available openings. The employment searches of consulting services are ideal and do not depend on internet job listings. Moreover, the services are completely created by an in-house team of recruiters, who have a good experience. They are designed to help and create an advantage for the candidates. They are ideal for helping and identifying career opportunities before they open for the online world. This helps to avoid competition greatly. Furthermore, we are professional immigration attorneys that provide searches to their clients. They are credible and direct in-house employment services. There is a comprehensive database of prospective employers and potential hiring companies which is available to individual clients. We also help in the process of learning. After this, the potential candidate can increase the chance to stand out from other competitors. We also share the techniques and strategies which are in the use of recruiters. 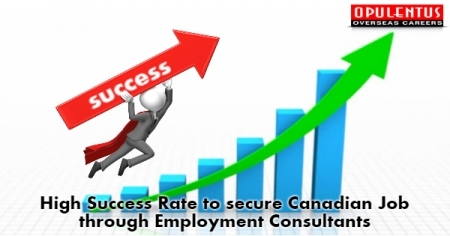 We come forward in presenting your qualifications to Canadian employers. Before reaching Canada one can learn some important techniques of job hunting. This will be an asset and ensure success.